* Moses sings a song. It’s a bit long, kind of a downer, and without any kind of infectious pop beat. I’m sure Simon would hate it, Paula would love it and Randy would still be trying to get everyone to think he’s really cool. * The Israelites have a seven day music festival outside the walls of Jericho that makes Bonaroo look like amateur night at The Apollo. They literally brought the house down. Lots of houses actually. And then they killed everyone. So the forty years in the desert have come to a close and Israel is about to cross over the Jordan River and move into the Promised Land. There’s only one problem…it’s inhabited by tons of people who don’t really want to hand over everything to this crazy group of gypsies wandering through the desert who think they’re entitled to everyone else’s stuff simply because their God told them they could have it. Except, it isn’t really a problem at all because God is leading Joshua, and Joshua is a firm believer in killing anyone who gets in his way. So where does that leave us? It leaves us on the brink of an epic war equal to those fought in the land of Middle Earth. (What’s Middle Earth? It’s where nerds pretend they live. It’s also the setting for The Hobbit and The Lord of the Rings.) The word is out that the Israelites have defeated a couple of nations in the past, and this time around, no one is taking any chances. So five local kings in the area team up to fight and dominate Israel. Things don’t go as planned for those kings, and they quickly find themselves impaled on poles, by Joshua. And as scripture so delicately states, “So Joshua and the Israelite army continued the slaughter and completely crushed the enemy. They totally wiped out the five armies…” (Joshua 10:20) Five armies down, and that’s only the beginning. As God continued to hand city after city to Joshua, he continued to annihilate person after person. Only with less John Cleese, and more blood spraying all over the place…also with a lot more moaning, suffering, and recently amputated limbs flying everywhere. So, I guess what I’m saying is maybe it was really more like that scene in Kill Bill where Uma Thurman turns a cool Japanese nightclub into a modern day Thunderdome with her Samurai sword. At the end of it all, Joshua and God’s army had completely destroyed thirty-one kings and their kingdoms. They went on a 31-0 killing streak. That’s some serious conquering and a whole heck of a lot of killing. That body count had to be in the millions. 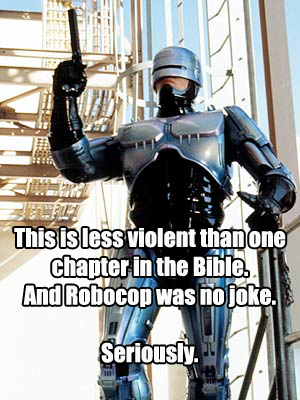 And that’s about the same as Robocop. So…why isn’t the Bible rated R? This entry was posted in Christianity, Humor, Joshua, Old Testament, Religion, The Bible and tagged Biblical Violence, Bloodlust, Epic Battles, Honestly, I LOVE Lord of the Rings, Jericho, Joshua, Lord of the Rings, nerds, No offense, Outdoor Music Festivals are Biblical, Proud to be a Nerd, Robocop by Mac. Bookmark the permalink. Oh my goodness Mac!! I love you!! 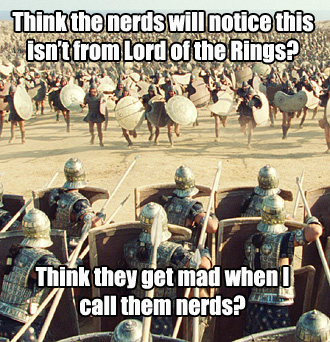 Lord of the Rings AND Monty Python references….seriously EPIC!! hahahaha…wow!!! Praying for you!! 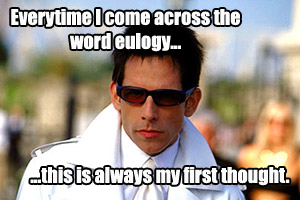 Add to that a Troy reference (hidden amongst the illustrations), a Zoolander reference, and a Robocop reference. Pure awesomeness. Haha! I think it is rated R…we just skip over the non-rated-R parts in kids’ Sunday School classes. And then there’s that awkward moment where the 7-year-old kid who likes to read ahead asks his mommy awkward questions about things that happen towards the end of Genesis.